Global e-commerce sales have exceeded $2 trillion, and they are going to double by 2020. That said, there's no surprise in saying that e-commerce is one of the most optimized tech sectors. Still in this ultra-optimized sector, only three years ago, Tobias Buxhoidt, Anton Eder, and Julian Krenge found yet another way to improve customer experience and increase online stores' revenues and retention rate. The niche they discovered was the shipping process, and the solution they created was parcelLab. There was a huge user experience gap between the moment the customers check out from their favorite store and the moment they receive the product. This created a lot of room for improvement. On the one hand, we had the engaging experience delivered by online shops and the cold old-fashioned delivery notes sent by post and logistics companies on the other. The solution was to patch the shipping process with a service delivering the best possible after-sales customer experience – make it personalized and emotional. At the same time, online shops gained an opportunity to benefit from many customer touchpoints that they used to hand over to companies like UPS or FedEx. It worked. parcelLab develops two main products: tailored delivery notifications and a custom track & trace page. 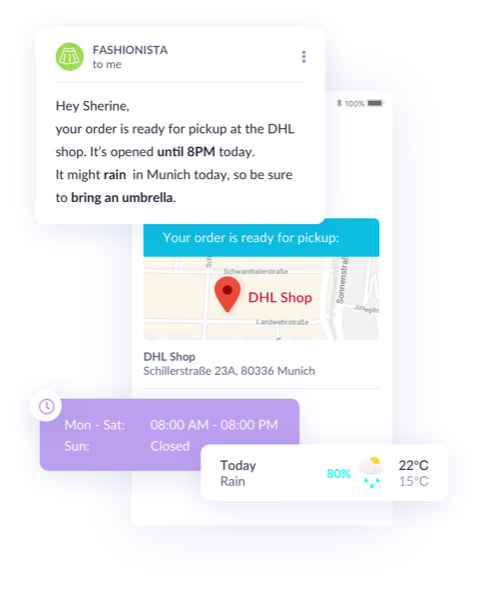 Once a customer finalizes the purchase, parcelLabs takes over the communication with white-labeled customized messages matching the store's brand. parcelLabs delivery notifications are useful for customers, who want to be informed about their order and receive relevant marketing and product information. The delivery notifications generate opening rates of over 70% and click rates of over 30%, and this traffic drives repurchase rates. 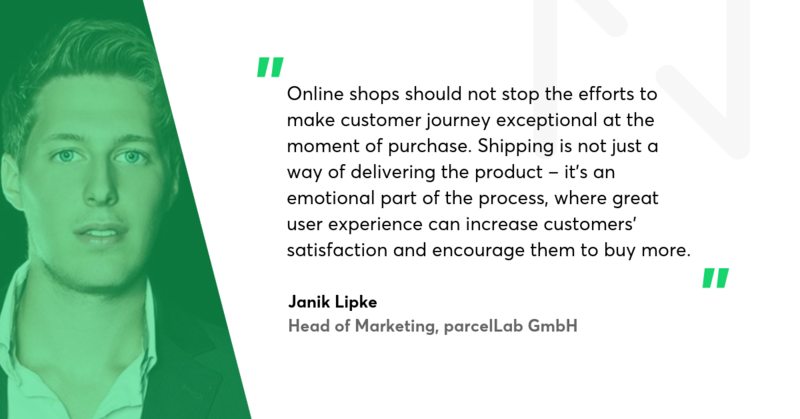 ParcelLab's clients noticed that there was untapped marketing potential in the shipping part of the customer journey. Online fashion retailer Marc O'Polo was able to generate 65,000 additional customer touch points resulting in a 0.4% repurchase rate, while fashion and sports retailer 11teamsports increased their revenue by 19 percent in just two years. Weltbild, one of the biggest online book retailers in Germany, after Amazon, has reduced the return rate by up to 5 percent since it started using parcelLab. "Thanks to parcelLab, we were able to improve customer communication and make it more transparent. Weltbild puts its customer centre stage across the entire customer journey – no matter where they are at the time. This gives them an all-round good shopping experience", said Christian Seiler, CEO of Weltbild. parcelLab has won a substantial part of the German e-commerce market and has recently opened a new office in London. The company provides services to around 30% of the top 100 German online shops. parcelLab's team has 26 people in two offices, and provide services to 350 stores all around the world. 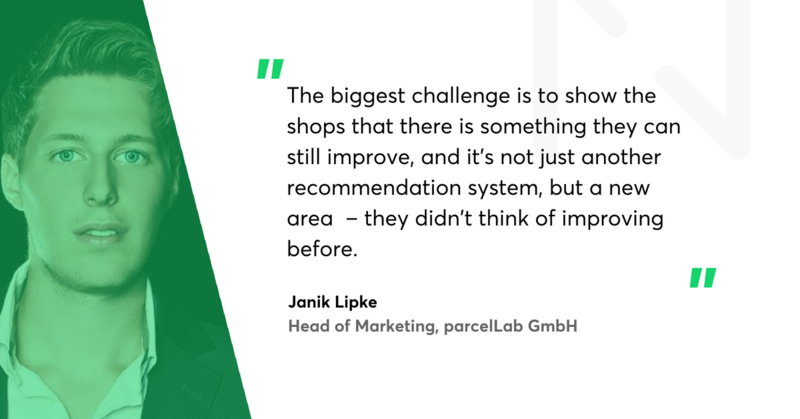 We talk with Janik Lipke, Head of Marketing at parcelLab GmbH, about the recent success and the challenges the company faces in growing bigger. Bartosz Ciszewski: What's the idea behind your product? Janik Lipke: We want to improve the customer experience of the shipping process drastically. parcelLab delivers two main products: delivery notifications and a parcel tracking page. They enable online shops to connect with their customers during shipping, making the whole process more personalized. Online stores invest considerable resources into acquiring new customers. They put a lot of effort into generating traffic, optimizing the conversion rate, and basically anything that results in a successful purchase. However, this ends after the checkout. After the purchase, customers usually just receive a “thank you” message for their order and a dispatch confirmation with a link to a DHL tracking page. What's wrong with it? It's a clear message. The problem is that for the customer who is usually excited about the buying decision, a neglected shipping communication can be frustrating. You have to realize how emotional this stage of online shopping is. You've made your choice, you’ve paid for it, and you are often not sure if the decision was right and if you are going to like the product. Tobias, Anton, and Julian have noticed this so-called "experience gap" and decided to create an additional service for online shops that would patch it. The goal is to make shipping notifications and parcel tracking a pleasant personal experience. This way, shops that use parcelLab see an increase in the retention and a fall in return rates. What was the biggest challenge in growing your business? As with any other startup, the beginnings were very hard. In our case, the proof of concept came very quickly. Our clients don't need much time to recognize the benefits of using parcelLab. The biggest challenge is to get through with the message. There are so many services for e-commerce that it is difficult to reach online shop owners and managers with information about our product. They are often overwhelmed with marketing telling them how to improve their sales. Although our product is quite remarkable and efficient, it's difficult to capture their attention and explain the benefits parcelLab brings. The biggest challenge is to show the shops that there is something they can still improve, and it's not just another recommendation system, but a new area – they didn't think of improving before. And this is where Netguru showed up? Yes, we used Netguru for promoting our services. We were preparing a campaign aimed at different sectors of e-commerce. We needed compelling, elegant, and useful landing pages for the owners and managers of online shops from different categories: fashion, home & living, consumer electronics, and brands & products. That's how we turned to Netguru. Your team did a great job and delivered some excellent web design. What's the most significant competitive advantage of parcelLab? Is it the technology? The technology behind parcelLab is backed by complex algorithms including machine learning models that have already analyzed billions of shipments. Machine learning allows us to go as far as predicting delivery dates, times, or delays. With every client, we get valuable know-how on how to improve the shipping process and how to make the customer journey even more remarkable. Let me give you an example. The customer is not at home to pick up a package, so the package is dropped off in a parcel shop. With parcelLab, not only do we send a personalized message informing about the event, but we also attach a Google Map and a weather forecast for the time the customer is most likely to pick the parcel up. A person that receives such a message is positively surprised, which creates an additional marketing opportunity for the online shop – not the delivery company. Of course, all communication via parcelLab is white-labeled and every message is tailored to the shop's branding. This creates a comprehensive shopping experience for the customer. Online shops should not stop the efforts to make customer journey exceptional at the moment of purchase. Shipping is not just a way of delivering the product – it's an emotional part of the process, where great user experience can increase customers' satisfaction and encourage them to buy more.